Managing Director Retail in CONTEXT. Adam has extensive Retail industry knowledge, particularly in today’s competitive technology market, and is pioneering #newretailthinking. Winning the hearts, the minds and budgets of consumers will be key for Retailers looking to succeed in Smart Channels. Currently only 5% of consumers know where to buy a Smart product, according to a study quoted by Hans Carpels at the CEO Retail breakfast in Las Vegas last month. Retailers will need to apply savvy strategies to capture consumers against a backdrop of a number of players looking to gain market share in a market increasingly targeted by home improvement companies, IT vendors, big-data driven insurance companies and smart home technologies. The opportunities are huge: At the IFA last autumn, Jeremy Rifkin said that we are moving from a world of 13 billion sensors today to one that will use 100 trillion by 2030. Make it easy for consumers with a long-term and interoperable technology offering: expert guidance given by Benoit Van Den Bulcke, and we will hear about the AllSeen Alliance from EURONICS. This rich panel of speakers has been brought together by CONTEXT as part of what we call #newretailthinking – the ability to find new models and new formats in the old world of ICT Retail. CONTEXT will provide insight into best practices from across the world, and will chair this summit. We look forward to connecting with you there! Join us at the Smart Channels Summit DISTREE EMEA, Monaco on 26 February 2015. Meet with fellow ICT Retail professionals to focus on how the Retail channel will evolve to deliver smart technologies, solutions and services to consumers. CONTEXT CEO Retail Breakfast, CES 2015. In January, we were in Las Vegas at CES hosting our first Retail CEO breakfast with Régis Schultz, CEO of Darty and Hans Carpels the President of EURONICS International. They were joined by senior members of the Darty and EURONICS teams as well as other European retailers and senior representatives from the industry. We asked our two Retail CEO’s to talk about the new products and formats they are deploying in 2015. They both confirmed that wearables and smart home products are a big focus for retail in 2015 – this could be the breakaway year. For Hans Carpels IoT is one of the main topics for 2015, but the landscape is complex and fragmented, and it is not easy to serve as a retailer. Interoperability of devices is a major concern of consumers, and a as a way of recognising this, EURONICS announced at CES and that they have joined the AllSeen Alliance, led by Qualcomm, and are thereby targeting a leading position in smart home solutions. The EURONICS offer will depend on the size of their stores with 800 square metres being multi-specialists and the smaller formats being hyper-specialists. Carpels did not exclude the possibility that there may be some hyper-specialist stores entirely dedicated to the sale of connected products and wearables, the same as the Lick and Fnac formats in France, and which we have not yet seen in other European countries. When Régis Schultz addressed us he lamented the fact that for a company that aspires to sell technology their own salesmen and stores are not adequately equipped. He has set it as a strategic priority to change that with the Digitalisation of Darty, one of the planks of his 4D strategy. For Régis who started his career in an FMCG company where they always spoke about consumers, the whole raison d’être of retail is to transform the ‘consumer’ into a ‘customer’- that’s where the real value lies and where the profit comes. So it is impressive to note that the attach rate of installation to the sale of Nest products is 75% and that their service department is also installing Nests for customers who have bought their thermostat from sources other than Darty. Regis spoke of the creation of the Darty button. The customer presses it – it’s like a technology panic button and you are called back by the Darty service centre who are on call 24/7. 1,000’s of people have subscribed to this service and it demonstrates Darty making a reality of profitable service revenues linked to the IoT – and other retailers have shown that they are keen to follow Darty’s lead. We ended the breakfast taking the temperature of confidence about 2015. “From a product and solution side, we’re really upbeat. There are many new products and areas where we can add value.” said Carpels. “But we have to be realistic,” he continued. “There is a lot of education of the consumer to do. Only 5% of consumers know where to buy IoT solutions”, he quoted from a survey. I asked them if they thought that a product such as Nest smart thermostat could take off this year – with its £180 retail price tag there was a lot of doubt from our two CEO’s that consumers at a time of falling energy prices would see the value compared to a normal thermostat. But the jury is still out which makes 2015 an exciting year. He also spoke of France and Italy as stressed economies with real issues in Russia, Kazahkstan and Ukraine, in all of which countries EURONICS has operations. 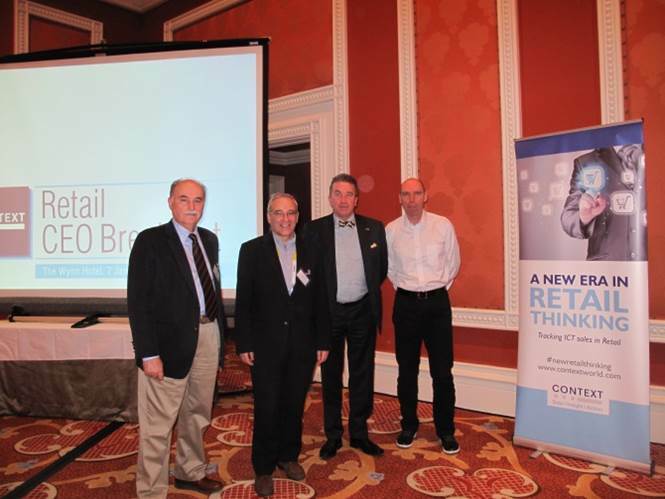 CONTEXT hosted a breakfast briefing at CES in Las Vegas last week. Our objective was to examine the issues European retailers would be facing over the coming months against a backdrop of fierce pricing pressures from online retailers. Confirmed attendees included players like Dixons, Boulanger, Auchan, Mondadori as well as the CEO’s of Darty, Euronics, Lick and Bimeks, and senior representatives from vendors and distributors such as Lenovo, Acer, Samsung, AMD, Netgear, Webroot, the GTDC and Esprinet. During the session, some of Europe’s leading consumer technology retail executives gave their view on market trends for 2015 and raised the question of whether connected devices and the advent of IoT would provide bricks and mortar retailers with new opportunities to revitalise sales and improve relationships with their customers. With so many categories fusing together to create the smart home environment, there is inevitably a degree of complexity. The challenge for retailers is to help consumers overcome the complexity and purchase the products. Retailers increasingly understand that they cannot compete on price against pure-play online retailers. They need to find a differentiating factor, which allows them to get closer to customers and justify the operating expenses associated with running physical stores. This year CONTEXT is hosting a breakfast at the CES show in Las Vegas. Our objective is to give a voice at CES where senior players can examine the issues which retailers are facing in Europe as we go into 2015. We have ICT retailers from Dixons, Boulanger, Auchan, Mondadori as well as the CEO’s of Darty, Euronics, Lick and Bimeks, and senior representatives from vendors and distributors such as Lenovo, Acer, Samsung, AMD, Netgear, Webroot, the GTDC and Esprinet. The old continent is divided – there are continued risks to euro integrity, the latest being the threat of Greece reneging on its agreements; UK growth vs Eurozone stagnation; the threat of deflation in France which has been recorded for the first time since modern records began; and the cutting off of Russia – not many Russians will be expected this year at CES. What does 2015 hold for ICT retailers and for the European economy as a whole? There are two encouraging macro-economic trends – the collapse in the oil price puts more money in consumers’ pockets and the QE being engaged by the ECB for the first time will stimulate growth. But overall economic prospects in Europe show a fragile recovery. Against this environment traditional ICT retailers face well documented threats – the growth of etailers such as Amazon and Ebay, the development of ecosystems in which they play a small role, such as Apple and Google, and the new threat posed by vendors themselves as they engage directly with end customers in a world of connected products. Régis Schultz, Darty CEO will address the CES breakfast and maintain that unless retailers step up and deliver high value service to their customers, they will no longer serve any useful purpose. Retailers must reclaim customer relationships which are their lifeblood and which are at risk. The Darty solution has been to advance unique service solutions. Schultz will talk about the innovative Darty button – it is a physical button which links to your wifi and smartphone, and is only available if you have a service contract. You press it and are put in direct contact with Darty service engineers 24/7. “Unless a product has a service opportunity we are not interested in it, for example we only sell Nest thermostats in a bundle with the installation performed by our engineers.” A 100% attach rate is a decision which Darty has taken even if they may lose some deals to consumers who want to instal themselves. Hans Carpels, the President of Euronics, the 2nd largest retailer in Europe with a consolidated turnover of 17.6 billion euros, will deliver a message about his view of the European technology market in 2015. He is uniquely placed being at the head of a retailer with a presence in 30 countries spread across North, South, East and West Europe. One idea which captured the imagination earlier this year was the Darty panic button – you hit the button and you are put in touch with a call centre which can help. There are many ICT retailers who are going to press a panic button if they don’t get their service model right, because they risk losing out. Here is why. Traditional retailers are already losing market share to etailers, but new threats are emerging: utility companies such as British Gas are linking the installation of new boilers to the creation of a smart home, with, for example the installation of smart thermostats and other kit. DIY retailers are trusted for service and installation, so how long will it be before they create a smart package with the installation of a new kitchen. Specialist retailers are emerging which are dedicated to the sale of wearables and connected devices. One of our keynote speakers at the Smart Channels Summit in DISTREE Monaco in February 2015 is Stephane Bohbot who has set up the Lick stores in France – in an interview with him in the FT he said that his salespeople are “coaches”. In the world of connected devices, a practice which was once taboo is now becoming commonplace –manufacturers are establishing direct links to end customers – unless retailers find a way to maintain their customer intimacy as retailers like Staples and Lowe’s are doing with the creation of a hub, retailers will lose out. This journey involves investment in people, training, product availability, partnerships with other providers. Currently I am trying to order a Nest Thermostat so that I can walk the talk of a smart home myself. Two leading bricks and mortar retailers offer a solution through their call centres and websites but none has been able to assure me at the moment of passing an order that I would have both the product and an installation date. One of them told me I would have to go in store to get it ordered. No-one I spoke to really knew what a Nest Thermostat was. The question is – who is prepared to give full service to their customers, and win the prize of a new generation of products and customers. 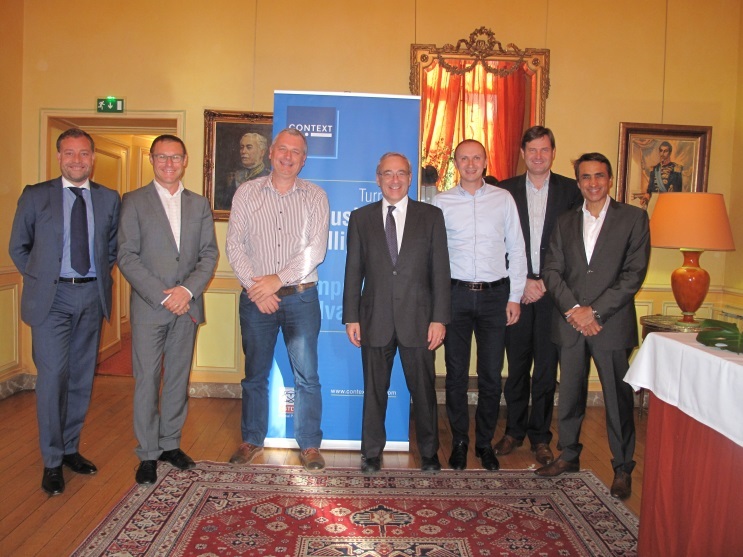 The Advisory Board for the Smart Channels Summit met on Friday 7th November in Paris. We were getting ready for the event which will take place at DISTREE in Monaco on 26th February 2015. The photo shows us having a pause before lunch in the fabulous surroundings of the Maison Amerique Latine in Paris. The Summit will address best practices in the sale of wearables and connected devices in a context of explosion of consumer demand for these products. The key reason for bringing together in an Advisory Board eminent people from the ICT world is to make sure that we are asking the right questions. • In a world of connected devices with manufacturers connecting directly to the end user, how does retail continue to own the customer relationship? Should they be investing in creating their own hub system for connected products like Lowes and Staples? • What can retailers working together with vendors and distributors do to generate demand for connected devices? Who drives the merchandising? Is it up to the retailer or the vendor or both? • How much education is necessary for the consumer? Do retailers plan to invest in more training of store employees in order to equip them to sell connected devices? • With a multiplicity of technical solutions available on the market how do retailers bring it all together to make a coherent whole for the consumer? How do retailers ensure that the solutions they propose are a long-term proposition allowing for future upgrades and additions to the home? • By the time of the conference in Feb 2015, we will have the experience of Christmas 2014, and the launch of the Apple iWatch – will smart watches finally emerge as a killer category? Is it all about the apps like the iPhone introduction? • Do connected products and wearables offer the possibilities to retailers of new private label products? 11 years ago there was a retail accounting scandal which led to the dismantling of Ahold as an international retailer. On February 24th, 2003 the CEO and CFO resigned having declared an overstatement of profits of $500mn (subsequently revised upwards to $900mn) over the three years from 2000 to 2002. Its market value plunged by 63% that day, to 3.3 billion euros. In late 2001, it had exceeded 30 billion euros. Tesco’s market value went down by 12% on the day it was announced, though its share price and stock value have been on the slide for the last years halving from a high in mid 2013 of 388p per share to its current 193p. There are similarities between the two as both revolve round the treatment of rebate income. In Ahold, buyers at the Foodservice subsidiary were in collusion with suppliers on overstating promotional allowance income. The suppliers went so far as to confirm falsely inflated balances to outside auditors as part of their year-end audit. The scandal took place over the course of years and was linked to a sustained failure of corporate governance with an overpowerful CEO. In Tesco corporate governance has worked as a whistleblowing person from Finance has lifted the lid on the bad practices. The acid test will be whether this is a one-off manipulation that has been used to flatter the half-year results – the leadership team have been under enormous pressure to deliver results this year – or whether this has been going on for years. If it is the former then whilst disappointing the company should move on, and be pleased that they did not allow the problem to build up as happened in Ahold. If it is the latter, and it became too difficult to sustain when the results got worse this year, then Tesco will face a number of more serious questions.